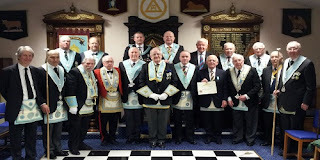 Broken Arrow, OK -- Faced with a lack of older members in many lodges, younger Freemasons often feel like they are missing out on the proper Masonic culture that others take for granted around the US. That's why many Millennial aged Freemasons are turning to the internet for help. "A lot of the lodges around here are filled with guys in their 20s and 30s, or maybe a few old timers who might be in their 40s. We no longer have that old-boy Masonic culture that we keep hearing about in other lodges," said WB Jimmy Dinkle. "I mean, a typical meeting here is pretty short because we've already emailed the PDF of the minutes to everyone, and most discussions about lodge business are happening over our Discord channel, so we've never had that thing about guys sitting around complaining about buying a new coffee maker or patching the parking lot or that kind of stuff." that is on the verge of dying out. "In order to not lose what the other guys think is an important part of lodge culture, we've been getting YouTube videos of those older guys in other lodges. You know, sitting around, having arguments over how much money to spend on the roof, complaining about how things were better in the old days, planning the fish fry dinners and pancake breakfasts. You know, Freemasonry like our grandfathers did." WB Jimmy is in the process of starting a YouTube channel to store those videos to help other lodges with similar problems. "It's obviously an important part of Freemason culture, and we need to do our best to preserve it," he said. This made me laugh so hard, I think I threw my back out.